Using Steps: First, paste the door sensor on the door and the window sensor on the window. Then, open the Xiaomi Smart Home APP, click the "+" on the top right corner of your phone and add Xiaomi intelligent mini door window sensor, and jab the reset hole of mini door window sensor according to the voice prompt. 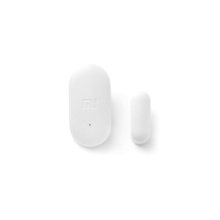 *Xiaomi intelligent mini door sensor and window sensor, functional and daily home security guard. Small pocket size, very easy to install and use. *Mini door window sensor helps detect whether the door & window is open or not in real time. If someone broke into your home, the alert will remind and take video, keep your families and your property safety. *Combining doors windows sensor and Xiaomi Yi camera, remote push video functions, when someone burst into your home when you stay out, Xiaomi Yi camera will cut out video which lasts 6 second automatically and push it to your phones. *Paste the doors and windows sensor on the window and connect Xiaomi Air Purifier on your phone, then open the window to ventilate early morning, purifier auto standby. *After setting linkage scene on your phone, the doorbell rings when someone open the door. Combining smart socket and setting linkage scene on your phone, the lamps light automatically when you open the door. *The shell is made of high quality UV material, fashion appearance and durable. *Low power consumption, so in general, you do not need to change the battery in 2 years.